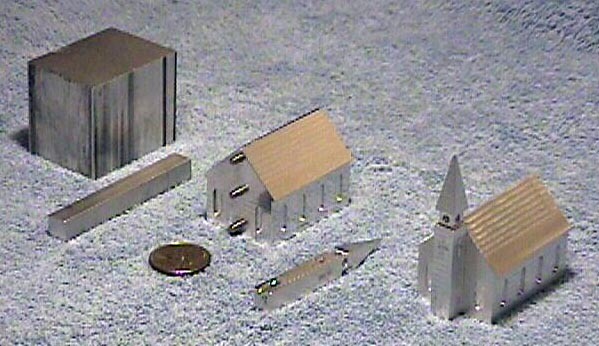 A CNC church in two parts by Tom Hubin - Millhill Supplies Ltd. This project is an excellent example of how a number of CNC files and fixtures are used to handle all the various operations involved in making a multi-sided part. It’s not simply a matter of one G-code file that does everything. The files can be found by downloading the ZIP file linked in the paragraph below. 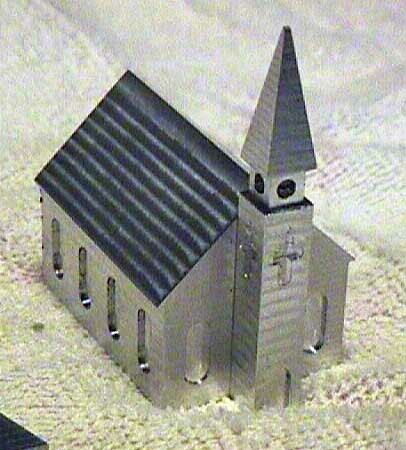 This church is machined completely using CNC. 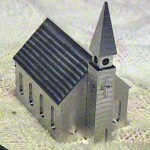 It is made it two pieces—the church and the steeple—that go together with pins. The dimensioned drawings were done in a program called “Vellum.” They have a .VLM file extension and can be viewed by downloading a free utility called “Vellum Share” you can obtain at http://www.ashlar.com/products/share.html. There are versions for Windows and Macintosh. 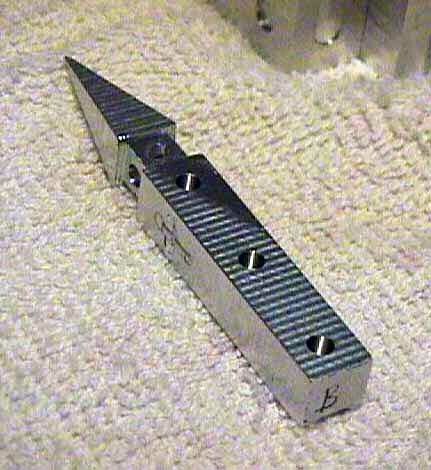 In some cases the drawings also show the holding fixtures. The drawing files can be found in the Zip file linked below. I ran the G-code with TurboCnc 3.1a on my Sherline 5410 mill. After design and making the jigs I made a batch of 8 churches for Christmas 2003. I started the project early November 2003 and finished March 2004. A few months late for Christmas but well received nevertheless. 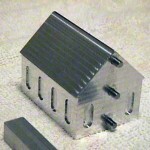 Machining and handling time for the building and the steeple is about 6 hours each when done in a batch of 8. That is about 12 hours per church. The project was inspired by one page of a Home Shop Machinist magazine article that was sent to me by an acquaintance. 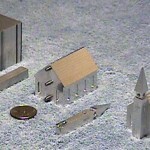 The files needed to make the parts can be obtained by clicking on the file name CHURCH.ZIP to download a 354 Kb Zip file. One of the zipped files is called “SEQUENCE.TXT.” This file will explain the order in which the other files are run and what they do. Designed by Tom Hubin Nov 2003. Copyright Tom Hubin, 2003 and 2004. The church was run in the September/October 2002 issue of HSM. It was designed by Walter Yetman of New Jersey and close friend Rudy Kouhoupt. Walter made the church as a gift to his pastor and dedicated the article to his friend Todd Beamer who was Walter’s son’s Sunday school instructor. Todd was killed in the 9/11 crash of Flight 93 in Pennsylvania. He was the one who declared, “Lets roll,” as he and a few others went forth to overwhelm the terrorists. 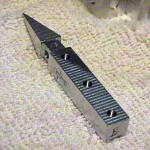 This article first appeared on the Sherline CNC projects page.